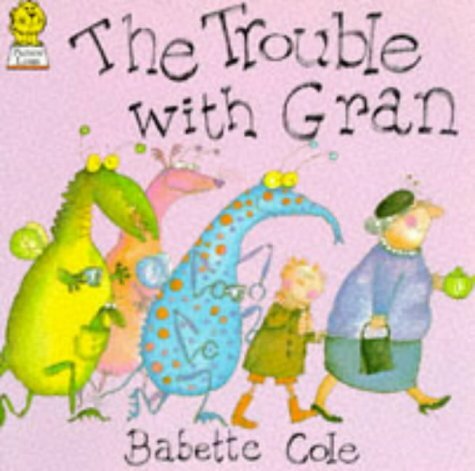 I have always loved Babette Cole’s humorous stories with their quirky illustrations and I first read ‘The Trouble with….’ stories when I was doing my teacher training. 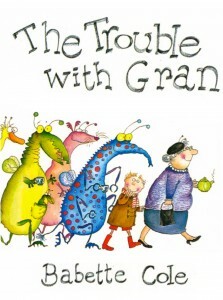 We already enjoy The Trouble with Gran picture book so I was very curious to see the newly published eBook. The Story: Gran is not like other grans, she’s an alien. Teacher organises a seaside outing for the local OAPs but Gran misbehaves. She disrupts the Old Time Music Hall and is asked to leave the amusement arcade. She meets some aliens on the Lunar Landscape tour and takes them out to tea so everyone misses the bus home. Undeterred she flies everybody to her planet where they celebrate carnival and when they get home she opens her own travel agency in Dad’s garage. The Trouble with Gran takes a familiar scenario and adds a humorous twist with an alien main character. My daughter laughs at Gran’s antics although she doesn’t yet understand all of the humour in the text. We find the pictures very amusing (my daughter thinks Gran’s green hairy legs are hilarious and I love the picture of Gran cheating in the Glamorous Granny contest). The sentences are short but the text has introduced several new situations (e.g Old Time Music Hall) and new vocabulary to my daughter (she now wants to try the limbo!). There are so many details in the pictures that move the story along, my daughter is constantly finding new clues to Gran’s alien identity (despite repeated readings we’ve only just noticed her alien foot in one of the pictures!). I have used The Trouble with Books in a Reception / Year One classroom. The short sentences are supported by lots of visual clues which makes them great for beginner readers. We read The Trouble with Gran and The Trouble with Dad on the iPad and found them very easy to use. After a short introduction by the author you have three options; You can read the book by yourself, you can listen to the author read the book or you can watch and listen to the author reading the book. 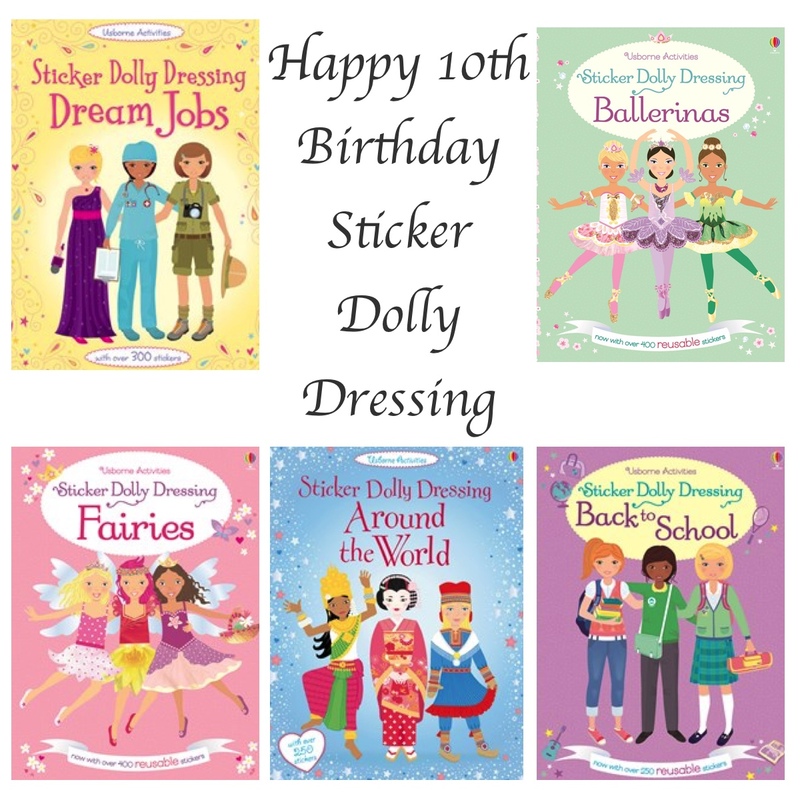 I really like the fact that children are introduced to the author and can see the person who wrote and illustrated the book, it personalises the story for me. It is great to have the option to watch the author read the story (she is on a little television screen in the corner of the picture) or just be able to listen as you enjoy the pictures. Babette Cole’s fantastically humorous illustrations look great on screen and for me the read the book to myself version was comparable to reading the picture book. On some pages you have the added bonus of a slide function which adds an extra element to the picture (In The Trouble with Dad eBook the slimming robot used the slide function to ‘slim down’ a rather large lady which made us laugh). I think that the publisher, Inky Sprat, has done a fantastic job recreating Babette Cole’s stories for the generation of children who have more access to technology. The Trouble with eBooks can be read on iPad or iPhone (version iOS 5 or later). Gran’s alien antics liven up a dull day at the seaside. 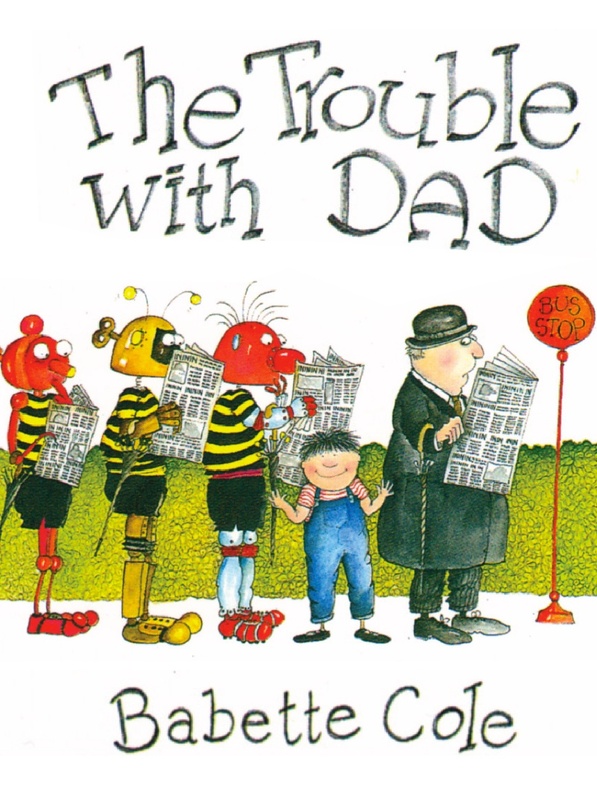 Dad’s robot making hobby gets him into a lot of trouble before it makes him rich. Thank you very much to Inky Sprat for sending the eBooks to us for look at, we’re looking forward to seeing what you will publish next. ‘The Trouble with’ eBooks can be downloaded on iTunes and more information can also be found on Inky Sprat’s website. Sounds like a wonderful book. I love gran being an alien; what a creative twist! I know The Trouble with Mum but I think The Trouble with Gran is still my favourite 🙂 Babette Cole’s pictures do look really good on the iPad. A wonderful idea and makes me think about my own gran … hmmm … it is possible she was an alien too! My grandmothers both had a few funny quirks but neither of them had hairy green legs or tails 🙂 Thank you for visiting Story Snug. I’m here from the Kid Lit Blog Hop. What a cute book! Thanks for the review. I’ll spread the word on Twitter! That book sounds absolutely hilarious! It’s so creative! 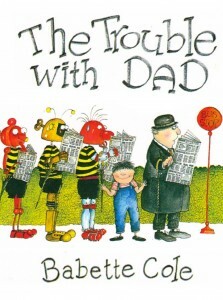 Thanks for linking your post in the Kid Lit Blog Hop. I always love your recommendations. Thank you 🙂 It is a very funny book with lots of humour in the illustrations.